The trees were naked from the harsh autumn winds and seamed to cringe from the immense cold. It was the kind of cold that seems like no matter how much you try to warm up, you are still chilled to the bone. Although it was already almost noon, the sun couldn't be seen. A few small rays seeped through the clouds, but were quickly swallowed up again by the menacing clouds. The few birds that would normally still be perched in the trees had flown south to survive the long, harsh winter. The shadows were long and full, perfect for those who didn't want to be seen. As he did not. He slowly made his way through the forest. It was only by chance that the villager saw this dark shape dash into the shadow of a tree. William was chopping wood when he saw the dark figure out of the corner of his eye. A boar? It couldn't be. Long ago had the game animals left in search of better, warmer lands. He took the axe he had in hand, and left the wood he was chopping to go after the game. To be able to catch such prey would be a great victory and would feed them for weeks. If was got this, his sister would not be able to say anything about him not working or providing. He entered the woods cautiously. 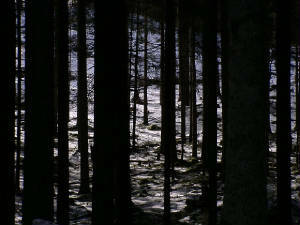 The forest was dark and the trees were close together. There was a feeling of evil, like the trees didn't trust William or why he had wandered there. He tried to sneak through in between the trees. SNAP!! A twig broke under his weight. Have to be more careful, he thought. Don't won't to scare him. Now were could he ... But before he could finish the thought, he felt his chin lifted and a blade put to his throat, pressing hard against his skin. "Don't move or I'll cut your throat. Tell me your name and make it quick," said a man’s voice with a growl. "My name's William. William Caltiage." "How old are you William?" "Tell me, what would you be doing out in the cold and the wind?" The man’s voice was to as threatening as he had originally been, but the dagger was still sent the same message. "Well...you see…I was chopping wood and then I was hunting you.” At this the man tensed and William quickly added, “I saw your shadow and thought that you were a animal. At this the man chuckled and sheathed his dagger. William turned around and saw his attacker for the first time. The man was very tall, about six and a half feet tall. He looked strong, but not huge. He was kind of skinny, yet not in an unhealthy way. His clothes were dark and dirty, and his face was hidden underneath his hood. In many ways William looked like the man. He too, was taller than most. He was six feet and skinny as well. His hair was short and brown, his eyes were a dark blue, and was average in strength. "What's your name?" asked William. "Yes, just Oslick. This is a pretty lonely place, how do you survive out here?" "We own a small farm that we grow food on and I hunt for food in this forest in the better hunting seasons. When I can, I smelt old junk and make it into to something new and sell it to buy food or materials that we need. The rest of the time I’m farming, chopping wood, or working around the house." "My sister, her husband, and their two sons live in the house, while I live in the upper story. They usually don’t do much. My sister cooks and cleans sometimes and her husband occasionally comes and helps me when he’s really bored. My mother became ill and died years ago. I never knew my father except through some stories that my mother told me before she died." "What did your mother tell you about your father?" "Well, not much. She said that his name was Richard Caltiage. That's were I got my middle name, Richard. Once, a long time ago, she told be that he went to fight with some rouge named something like Leomare. She said that he had a group of men with him and that they all went to some sort of battle. He took his armor and went with them. After that, he never came back." "A rouge named Leomare? Hmm. Well, at least you know something about him. Many people don’t anything about their fathers. In these times of war, many people have lost family members or their entire family. Well, since it doesn't look like you got much going for you here, why don’t you come with me? " "What about my sister and her family? I can't just leave them. How would they be able to live without me to farm and hunt?" At this, Oslick took out a sack of coins from his belt and tossed up to the house. "Let the man learn to provide for his family. Either way, the choice is yours. Come if you want, or you can stay." Then he turned and continued on his journey. That night, as the sun set over the frozen land, two trails of footprints leading deeper and deeper into the trees. As the sun began to fade, Oslick slowed his pace. Finally he stopped in a small clearing in the forest. They set up camp, and he said, “We'll need a fire and some food. You go get some wood, while I get us some food.” With that he withdrew a bow from his pack along with several arrows. He strung the bow and put the arrows in a quiver. Then, he took one out, put it on the string, and went into the woods. He's not going to get anything, William thought. He would have to hunt for hours just to see anything. Despite his doubts about the food, William went out into the forest to find firewood. At least we’ll have a fire during the night. He had the axe he was using before he left the day before that he took with him to get wood. He had made two trips to camp with his arms full of wood. He was on his way back from his third and final trip when he noticed Oslick sitting over the stack of wood. He crept up to the edge of the clearing and heard him mutter “brisingr” and at the wood burst into flames. He stood awestruck for several minutes. How could he have done that? He had heard before about magic and that it was very powerful, but everyone who spoke of it feared it. He continued to the campsite where he found the fire burning and over it two rabbits slowly cooking. “It’s about time! I was about to go looking for you. Come on. Put the wood down in the pile, the rabbits are almost done.” Oslick was sitting by the fire, ready to eat his meal. “How did you do that?” William asked as he stood before the fire. “Now is not the time to talk about that,” the look in his eyes said not to pursue this question any farther. They sat in awkward silence for several minutes. They finished their food, and William was about to lie down when Oslick threw him a sturdy stick. “What’s this for?” William asked. As if to answer, Oslick hit him on the side with his stick. After a few seconds and a puzzled look from William, Oslick struck again. “Hey! Knock it off already! It’s not funny!” yelled William. Oslick struck once again, but this time William blocked the attacked with his stick. He felt the vibrations from the blow in his hands. Before his hands returned to normal, Oslick struck his other side. This time he was too slow and only managed to make the stick hit his foot. It hit one of his toes and he gave out a small cry. He was starting to understand. They were practicing for a sword duel. Oslick would continue to make blows and William would try to block them. Slowly he sped up the pace of the blows. Once William thought that he was doing well and could block almost anything that Oslick did, he started with different types of attacks. Diagonals, double strikes, and jabs all made it far more difficult to block. This training served several purposes. First, William was learning how to block blows and to keep his balance. He soon knew the most effective ways to block different types of strikes. The second was that he learned the attacks would look like. He could tell the motion that went with each kind of strike. It also taught him how to make these attacks. He quickly learned an arsenal of potential moves and strikes. After many different attacks and blows, he had it down. Then, when Oslick made a blow, he sidestepped. Oslick stick hit the ground at the same time Williams stick hit his side him. Not expecting William to go on the offensive, Oslick was taken aback by the swift blow. As was William. He did not even think about the actions that he had just made. They merely flowed, almost as instincts. William slowly lay down on his bed, trying not to hurt himself anymore than he has already. He went to sleep bruised and beaten. He only got a sore side. Not a very fare trade, he thought as he slipped to sleep. "So where are we going?" asked William as they left the previous night's camp. "What is in the north-east?" "Are going to refuse to tell me anything?" "You know, it's not too late for you to go back.” He stopped walking and looked at the younger man. “Here, take this, you might need it." He reached into his pack and pulled out something rapped in rages and handed the bundle to him. “Open it and you’ll see,” he replied as he began walking again. As he opened the sun’s reflection off the steel shined brightly in his eyes. It was one-handed sword that was clearly well used. The blade had many gashes and scrapes, though it shined like it was just taken from the forge. The end of the hilt was a diamond shape and the hand guard had a round gem in placed in the center of it. The sword looked rather regal in the sunlight and felt old, yet steady. 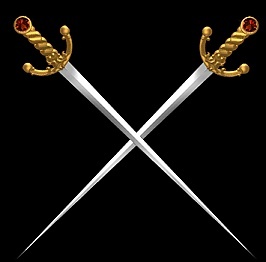 Even William, who had no experience with swords, could see that it was a good blade. He had to run to catch up with Oslick as he tied the sword to the belt around his waist. He suddenly realized the walking with a sword made things a little difficult. Shortly after that they reached the top of a small hill. From it they could see a large forest stretching for miles in either direction. Going strait through the forest was a narrow path that was blocked by a wall. The wall blocked the gap so that that no one could get through. It was about fifteen feet tall and five feet wide. The wall was well constructed so that there were no cracks to gain a foot or hand hold in. In the middle of the wall was a large, iron gate. There was no way to get through because of bars that blocked it. Just to the right of the gate, built into the wall, there was a tower. As they drew nearer, William saw that it was three of four stories high. Seeing William looking around, Oslick said, "To the west is the Dark Forest, and the east is the Forest of Sobra. Supposedly, this is the only pass through the two forests. The only other way would be to go around, which could take days. Maybe even a week." "Are we going to be able to get through?" "It depends on who is guarding it…and what is going on up north. If we are lucky, we will get through. If we are not, well..."
They continued on until they were about half a mile away from the gate. The sun was beginning its decent and Oslick decided to make camp and try to pass the gate the next day. They continued their training that they had done the night before, but this time they stopped early and sat down by the fire. "Why did you come with me?" Oslick asked. "I am not really sure that I know. I guess I just thought it was the right thing to do. There was something that drew me to follow you on your quest." Here he paused for a moment, then continued, "Maybe I just wanted to get away from my sister. She still treats me like I am her childish brother. She always has me do all the work her lazy husband refuses to. Perhaps I wanted to follow my father. Maybe I came for a lot of reasons. But one things for sure. I am not going back." "That is good that you are willing to stay with me. Now I that I know that you are willing to stay, I want to teach you something that you may need later. Magic. Magic is the simplest, most complicated, thing. There are four basic magical "elements". Fire, water, stone, and air are the most common. Of course, there are other elements, but these are more complicated and harder used. Some people devote their entire lives to the learning and use of magic. They are called wizards and are not very common, especially now days. As I was saying though, the hardest of the four elements to use is stone. The easiest are air and water. We will start with air." Here he picked up a small pebble and proceeded to teach William how to use magic. He held the stone in his hand, closed his eyes and said, in a clam, steady voice, ‘Stenr reisa.” The pebble lifted off of his hand and floated exactly one foot above his hand. A gust of wind blew in while he was maintaining this, but the rock did not move. William tried to do exactly as Oslick had. At first, nothing happened, but after the first few tries, William was able to make the pebble quiver. By the time they went to bed almost an hour later, William had managed to lift the pebble three inches off his hand. His last attempt had been the most successful. He wobbled the stone up and up. It moved very slowly and jerkily. When another gust of wind came, the stone was blown off balance and fell to the ground. “Why did it fall?” asked William. “Because you lack the necessary power, concentration, and ability. After more practice you will be able to hold it steadily. The last thing that Oslick said before they went to bed were words of warnings. He said, "Remember. Magic trains your energy. The more complicated the spell, the more energy it takes. But, the more you practice, the more stamina you build up and the more that you can do before you run out of energy. If you do something to hard or try to do too much magic, you could use up all of your energy and die. “The other thing you need to consider is the effect that magic will have on other people. Some people are afraid of magic and may try to kill you. Other people will be in awe and take a great interest in your abilities. In either case, people may take drastic actions. Some might recognize your power and try to recruit you. Others will try to harm you because they are afraid of something that they cannot explain. So, as much as possible, stay away from using magic around large groups of people. If you ever go to a more civilized city, then you can use magic more freely. Yet until then, be warned."